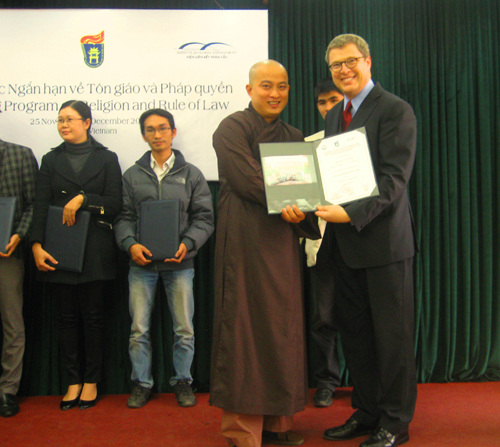 From 26 November to 5 December 2012, IGE, Brigham Young University, and the University of Social Sciences and Humanities in Hanoi co-conducted the first-ever ten day certificate training program on Religion and the Rule of Law in Vietnam. The purpose of the certificate program was to train an emerging generation of scholars, government officials, judges, and religious leaders on international and comparative approaches to religion and the rule of law. The training—using both comparative and interdisciplinary training methods—helped to build an emerging intellectual foundation as they develop a new legal infrastructure that contributes to religious freedom and the well-being of society. The program trained over 80 Vietnamese government officials, researchers, and policy advisors working on religious affairs and religious studies. The program also included observers from the Laos PDR and Myanmar. Trainers included law professors, judges, and political science experts from Belgium, France, Netherlands, United States of America, and Vietnam. The training curriculum focused on recurrent issues and challenges with respect to religion and rule of law in Vietnam and other countries. The topics taught during the program included: historical and theoretical perspectives on freedom of religion; comparative international approaches to regulating religion and belief; human rights perspectives on freedom of religion and belief; freedom of religious belief and expression; comparative constitutional perspectives on religion-state relationships; religious autonomy and self-determination; financial relationships between religion and the state; teaching religion in the public schools; and, religion and public life. The program also included a one-day academic conference. The conference focused on the legislative process and international comparative studies on religion. In addition to the 80 students participating in the certificate program, additional Vietnamese senior-level scholars, governmental officials, policymakers, and religious leaders participated in this conference. Furthermore, a number of students took a one-day tour to visit Vietnamese religious sites including Protestant and Catholic churches, a Buddhist temple, and a Muslim mosque in Hanoi. At the end of the program official certificates were awarded to students who successfully completed the training program.